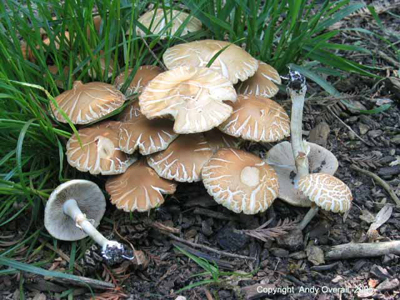 2004 got off to a great start with particular spring fungi appearing in my opinion, in record numbers. It has already been reported in various broadsheets that the St Georges Mushroom was popping up all over the place and they weren’t wrong. From mid April to early June Calocybe gambosa (St Georges Mushroom) could be found fruiting in many different areas upon Hampstead Heath as well as on other sites I visit fairly regularly across London. But what made it a particularly special spring for me was the number of Morchella species that I encountered. Also this spring I made my first London record of Mitrophora semilibera a much smaller Morel with a tiny cap. And during a foray with the North Somerset Group near Bristol we saw the most awesome display of Verpa conica some of which were over a foot high. Fruiting close to Hawthorn it is a rare species which is restricted to alkaline soils and probably has site fidelity. No less than 69 species were recorded on this foray, which is excellent for a spring foray. It was also a good spring for various species of Entoloma. 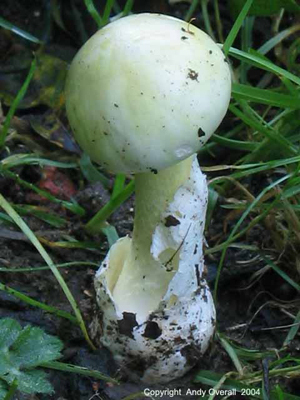 Entoloma aprile appeared for the fourth successive spring in a small elm stand on Hampstead Heath. A new record for me was Entoloma saepium a rare species growing in association with various Prunus species, for this I have to thank Keir Mottram of the London Natural History Society for bringing it to my attention. Entoloma clypeatum a more common species of the genus was a new record for me on Hampstead Heath. 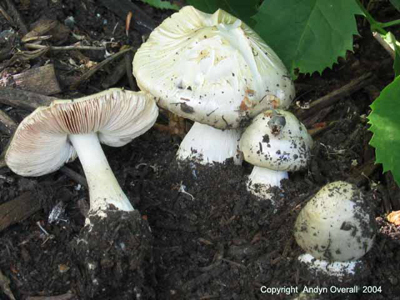 As we moved into late spring/summer Agaricus species began to appear and on Hampstead Heath during late May and early June I collected A.bisporus, A. nivescens, A.langei A.arvensis and A.bitorquis. 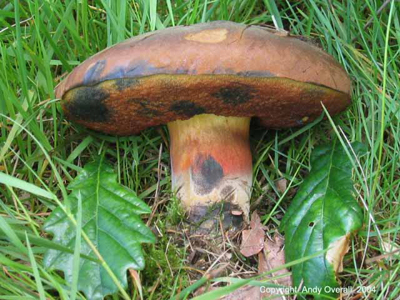 Boletus also began to appear around this time not in great numbers but beginning to emerge, among these have been B.erythropus, B.radicans, B,luridus, Xerocomus badius, Leccinum duriusculum and L.brunneogriseum. Some of the Russulacae have also been appearing notably Lactarius circellatus a ‘Milk Cap’ with salmon coloured gills and watery white milk which favours an association with Hornbeam in the U.K., another new record for me on Hampstead Heath. 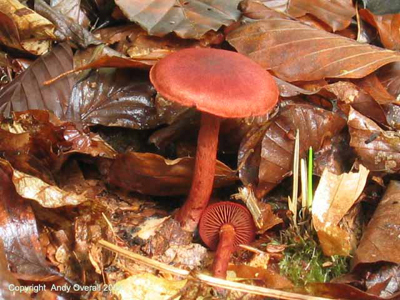 Russula parazurea and R. amoenolens have also been in evidence. 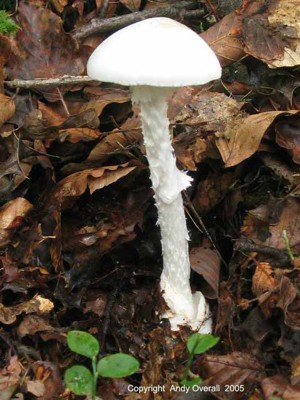 The early Amanita species are present with A. rubesens appearing in quite large numbers, also beginning to show are A.fulva and A. Spissa. Recently I collected Agrocybe putaminum from Golders Hill Park, this species was up until a few years ago recorded only from Kew Gardens. 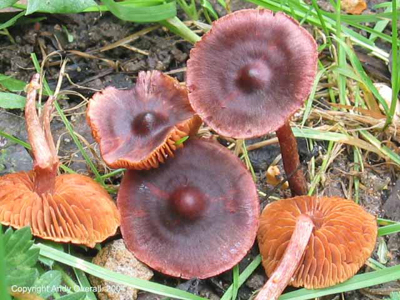 There are still only 17 records of this species on the BMS fungi recording database, but I suspect it is being over looked, so keep an eye for it. A. putaminum is very similar to A. praecox with one big macroscopic difference, it has no ring on the stem, microscopically it has much larger spores than A. Praecox ranging from 9 – 13um x 6 – 7.7um. 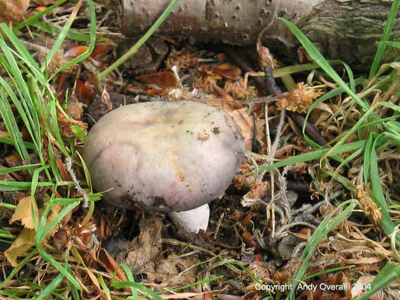 A. putaminum is an alien species to be found growing on woodchip beds. It was first recorded from Kew Gardens in 1986 by N.legon and has since slowly begun to spread along with the craze for woodchip beds. It is suspected to have originated from North America. 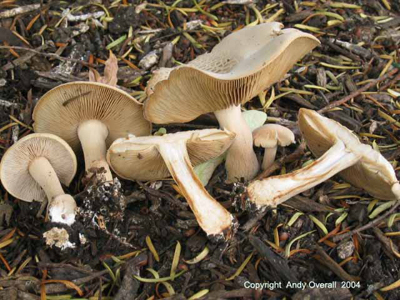 Another collection during June from the London area has been that of Volvariella bombycina an uncommon species in London when compared to the more common species Volvariella gloiocephala (=V.speciosa)another species that has exploited those composted woodchip beds. 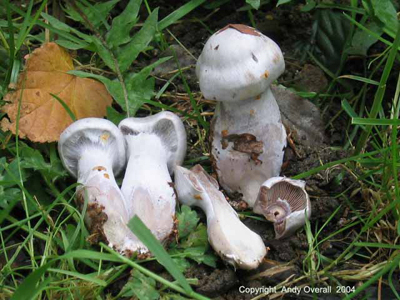 Volvariella bombycina (pic below) is quite unmistakable as it grows on wood of various broadleaved trees, from a substantial volval bag and has a silky/hairy cap that is yellowish/white and like its cousin it has white to pinkish gills that are free of the stem. The actual V.bombycina specimen in the picture below was very large for this species, normally it maximizes at 20cm across, this was 29cm across, quite a size. 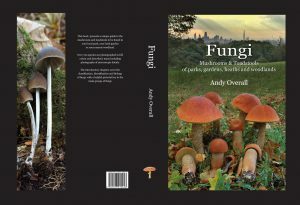 All this fruiting of fungi has been down to the complimentary weather conditons, especially the week long down pour we had during April followed by very warm weather. 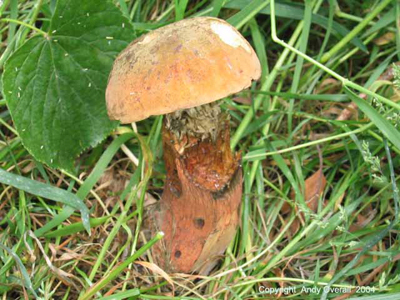 July has been an excellent month for fungi seeing the emergence of more Russula, Lactarius and Boletes in and around the London area. 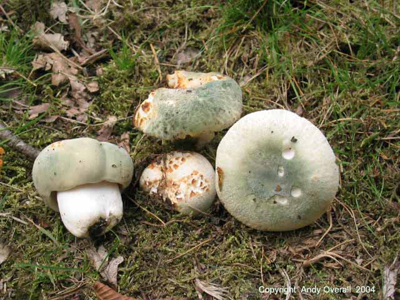 Some of the Russula species have been R.virescens, R.xerampelina, R.grisea,(pic below) R.vesca, (brown variety) R.delica, R.heterophylla, R.risigallina, R.amoenolens and R.atropurpurea. Among the Boletacae, Leccinum carpini, L.quercinum and Boletus edulis have made an appearance the former in fairly large numbers with Hornbeam in Epping Forest, where I also found mine and the forest’s second record of Lentinellus ursinus during the third week in July. I am now hoping that this trend continues throughout the summer and into the autumn to make up for the drought ridden seasons of 2002/3. Well, all my hoping paid off with what has to be one of the most fungi productive seasons for many years, we are now well into November and there still seems to be no let up, I do hope that we don’t pay for all this fungi with droughts over the next few years. It would be impossible to recount all of the wonderful fungi encounters I’ve had this year so far, so to add to the pics below I have prepared a page of some of the more exciting collections made during the main 2004 season. 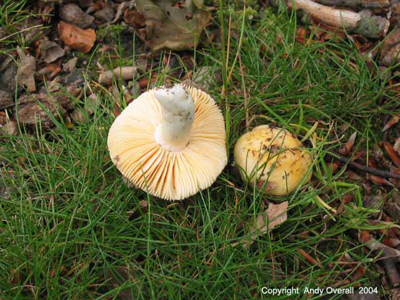 Amanita virosa ‘The Destroying Angel’ is more often recorded from the North of the country,this was the 2nd of three records from the New Forest in 2004, all of which were growing with Beech trees. A deadly but beautiful looking fungus. 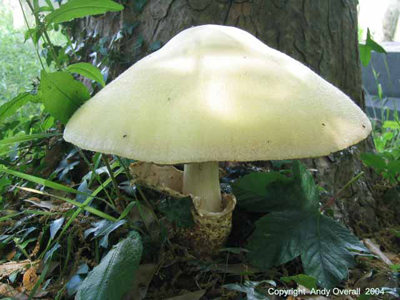 Amanita phalloides ‘The Death Cap’ is more common in southern England, though only localised. The specimen shown here was 1 of 2 records from Epping Forest in 2004, where it has a preference for Oak trees. Also deadly, together they could be the king and queen of the fungi kingdom. 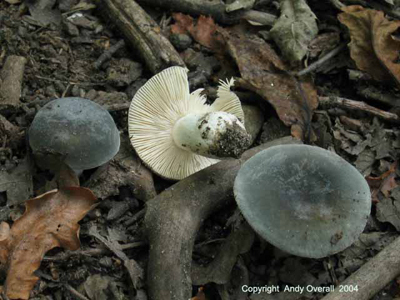 Take note of the volval bag/sac that these two species are exhibiting, it is more obvious here with ‘The Death Cap’. This, as well as having persistent white gills, is an important feature to remember for the identification of both of these species. 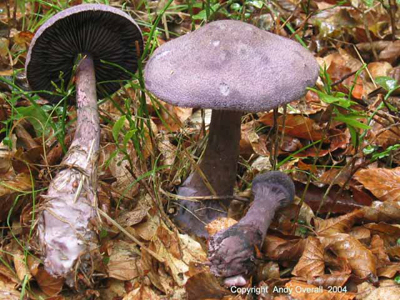 Shown here are a few species from the genus Cortinarius which I believe holds some of the most attractive fungi to be seen. The four species shown here were recorded from the New Forest during 2004. They are all mychorrizal with various broadleaved and conifer trees, making them an essential component of a woodland ecosystem.